Attention: EYEMAX-plus is currently backordered until May. Please be advised of this delay before you place your order. We apologize for the inconvenience. EYEMAX-plus AutoDelivery: GET TWO MONTHS FOR THE PRICE OF ONE! Reg. Price: $39.95 per month, your price: $39.95 every TWO months. READ THIS: By ordering now you become automatically enrolled in the AUTODELIVERY PROGRAM: Every two months you'll get a TWO MONTH supply of EYEMAX-plus for only $39.95 (+ s/h). That’s HALF-off! Cancel or change any time. I'm checking this box because I want the best price with AUTOMATIC DELIVERY. I agree to the terms above. I can cancel at any time. YES! I agree to the terms of Auto Delivery above. NEW Upgraded Formula with More Natural and Vegetarian Ingredients – 33 Essential Vitamins, Minerals & Anti-Oxidants Promotes Healthy Eyes And Supports Optimal Visual Functioning. This comprehensive, balanced and potent formula has more vision nutrients than other popular brands. A powerful nutritional supplement that supports the total health of your eyes and body. EYEMAX-plus is a high potency formula that is rich in vitamins, minerals and antioxidants. It contains a unique and balanced blend of 33 essential nutrients that are known to promote both eye and body health. Originally formulated by pioneering nutritional ophthalmologist Dr. Gary Price Todd, EYEMAX-plus is the Cambridge Institute’s best-selling comprehensive foundation for healthy vision. EYEMAX-plus is Vegetarian, GMO Free and Gluten Free. EYEMAX-plus does not contain: Dairy, Soy, Artificial Colors, Artificial Flavors, or Artificial Sweeteners. EYEMAX-plus does not contain added: Preservatives, Yeast, Sugar, Starch, Corn, or Sodium. EYEMAX-plus is a high potency formula that is rich in vitamins, minerals and antioxidants. It contains a unique and balanced blend of 33 essential nutrients that are known to promote both eye and body health. Lycopene, Lutein, and Bilberry Extract. As they age, most people experience increased eye problems. How can you ensure your eyes stay healthy and strong for as long as possible? Along with eating a balanced diet, you might consider taking supplements for eye health that offer nutrients essential for healthy eyes. With ingredients like vitamin A, vitamin D, lutein, bilberry and other vitamins and minerals that boost your eyes’ health, an eye care supplement from Cambridge Institute for Better Vision can help your vision stay clear and strong. 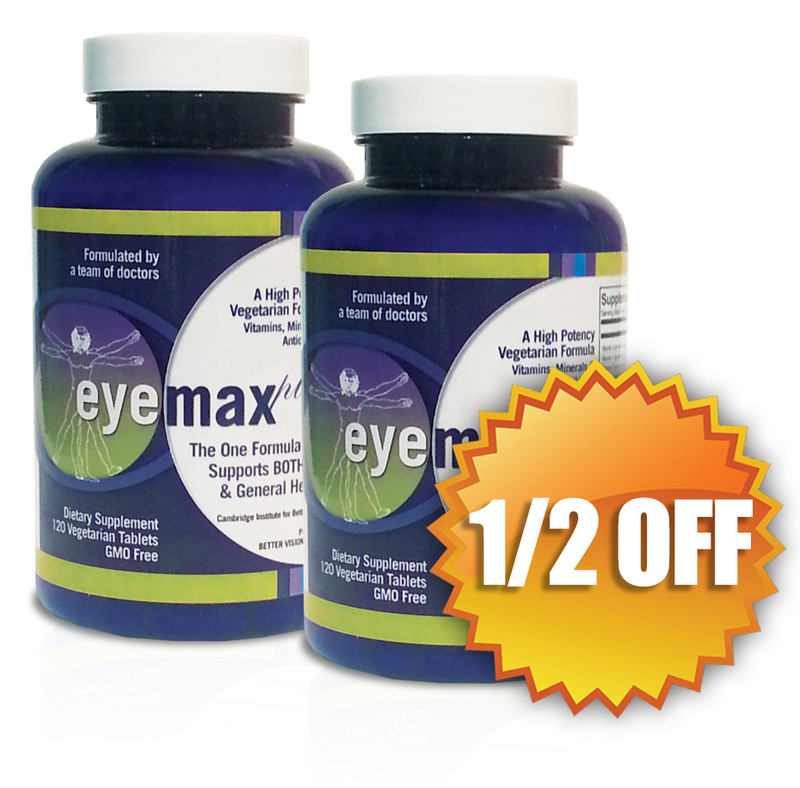 Our EYEMAX-plus contains vitamins and nutrients that boost your overall health. Eye vitamins and nutrients are the same as the nutrients that contribute to the health of the whole body. Thats why our formula can double as a daily multi-vitamin. Our products are gluten-, dairy-, soy-, and GMO-free. Use this page to order your natural eye care supplements today! What Nutrients Do Your Eyes Need? Vitamin A/beta-carotene. This vitamin keeps your eyes’ surface from drying out. Vitamin C. This vitamin helps strengthen your body’s connective tissue, including the tissue in your eyes. Vitamin B12. You don’t need much vitamin B12 to stay healthy, but getting too little vitamin B12 in your diet can hurt your optic nerve and cause other health problems. We take a holistic approach to health and nutrition. Since your eyes’ health is directly related to your body’s overall health, the nutrients in EYEMAX-plus benefit the rest of your body as well and will serve as your daily multi-vitamin. How Can You Take Care of Your Eyes? Our products are meant for clients who want to avoid invasive surgery or prescriptions to improve their vision. Supplements like ours may improve your body’s ability to take care of itself. Getting the right vitamins, minerals, and anti-oxidants in your daily diet will keep you healthier overall—which means your eyes will be healthy for as long as possible, too. We worked hard to make our formula right for people who are looking for vegetarian eye supplements and for people who are looking for GMO free eye supplements. If you want to learn more about our natural eye care supplements, keep reading! And if you want more tips on naturally caring for your eyes, sign up for our free newsletter. EYEMAX-plus contains at least 100% of the FDA minimum daily requirement of the most important vitamins, minerals and anti-oxidants. EYEMAX-plus does not contain dairy, soy, artificial colors, artificial flavors, or artificial sweeteners or any added preservatives, yeast, sugar, starch, corn, or sodium. EYEMAX-plus contains the essential nutrients that nourish all parts of your eyes, replenish your visual system and promote and support overall health. Order EYEMAX-plus today! Originally formulated by pioneering nutritional ophthalmologist Dr. Gary Price Todd, EYEMAX-plus is the Cambridge Institute’s best-selling comprehensive foundation for healthy vision. The new EYEMAX-plus Vision and Body Formula is an upgraded formula withmore natural ingredients and it’s VEGETARIAN, GMO-FREE and GLUTEN-FREE! Other Ingredients: Microcrystalline Cellulose, Stearic Acid, Croscarmellose Sodium, Magnesium Stearate, Silicon Dioxide, Dicalcium Phosphate, Hydroxypropyl DOES NOT CONTAIN: Dairy, Soy, Artificial Colors, Artificial Flavors, Artificial Sweeteners, Gluten DOES NOT CONTAIN ADDED: Preservatives, Yeast, Sugar, Starch, Corn, Sodium †These statements have not been evaluated by the Food and Drug Administration. This product is not intended to diagnose, treat, cure, or prevent any disease. ChromeMate® is a registered trademark of InterHealth. TRAACS® is a registered trademark of Albion Laboratories, Inc.
EYEMAX-plus contains a unique and balanced blend of 33 essential nutrients that are known to promote both eye and body health. The visual system - the eyes, nerves, muscles and processing centers in the brain - consume over 30% of the oxygen we breathe and more than 25% of the nutrition we take in. Our formula is based on a simple but powerful principle: You cannot separate the health of your eyes from the health of your body. The eyes do not exist in isolation, therefore nutrients cannot be directed to the eyes alone, but are used by the body where they are most needed. That’s why EYEMAX-plus is formulated to be a complete nutritional supplement that can double as your multi-vitamin, supporting your overall health, while ensuring that your eyes get all the key nutrients they need. Every vitamin, mineral or herb that research indicates is beneficial to your eyesight also has benefits to other parts of your body. For example: Vitamin A is helpful for the eyes, but it also helps regulate the immune system, among other things. Vitamin C works against free radical damage throughout the entire body, not only in the eyes. Lutein is found in very high concentration in the eyes, but it’s also found in the liver, heart and thyroid. When EYEMAX-plus was being formulated, each ingredient was carefully tested, not only in isolation but also in combination with other nutrients. It was found that some nutrients are more powerful when combined with others. The amounts and combination of nutrients in EYEMAX-plus was formulated to deliver the maximum benefit for your eyes and body. There’s nothing harmful or dangerous about EYEMAX-plus when used as directed. It’s not medicine or a drug with negative side effects. EYEMAX-plus contains the essential nutrients that nourish all parts of your eyes, replenish your visual system and promote and support overall health. 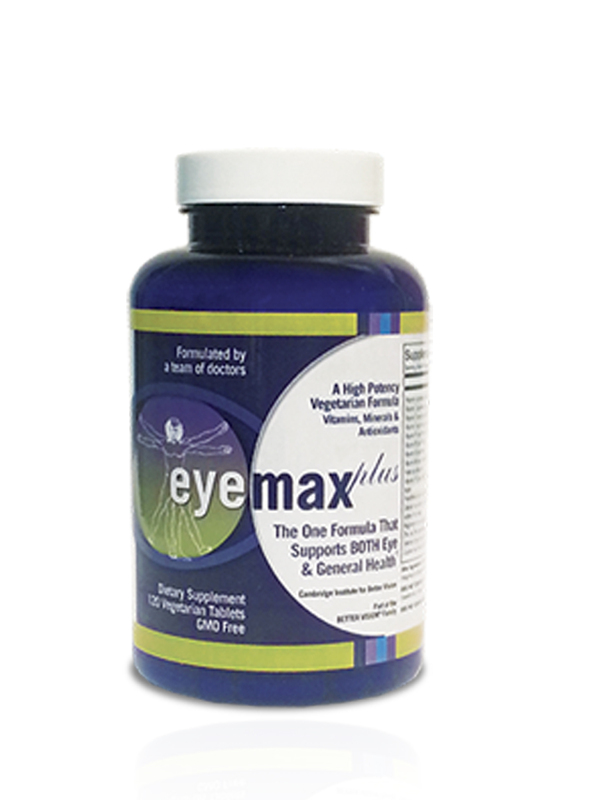 EYEMAX-plus was originally developed by Dr. Gary Price Todd, a pioneering holistic ophthalmologist and one of the first medical professionals to recognize the role of nutrients in eye health. Ophthalmologist Dr. Gary Price Todd was well ahead of his time. One of the most forward-thinking eye doctors in the country, he paved the way to healthier eyes for thousands of people by recognizing, studying, testing, and developing a way for people to use the proper nutrition to make their eyes healthier. After his death, Dr. Robert Titcomb, a long-time associate of Dr. Todd’s, worked with Martin Sussman, then president of the Cambridge Institute for Better Vision, to update Dr. Todd’s formula to integrate new research. The original formula was so well designed it didn’t need to be changed at all. Only additional nutrients were added, including Lutein, Zeaxanthin, and L-Taurine, which were not known when Dr. Todd started his work. Since Dr. Todd started his pioneering work, leading universities and government agencies, among them the National Eye Institute and Tufts University, have shown that vitamins, minerals and anti-oxidants are key to maintaining and preserving vision. We send EYEMAX-plus to all kinds of people all over the world. It doesn’t matter where you live - if you want to play an active role in the health of your eyes - we can send EYEMAX-plus to you! Not only is your Eyemax-plus great for the eyes......but I recommend it to others as one of the BEST Multi-Vitamins on the market today. You can depend on me for ordering it repeatedly because I know I can depend on EYEMAX-PLUS. Thank you for this product! “I am grateful for EyeMax-plus. After the first month, I was seeing much better and have continued to take them. I am now reading without my glasses except when watching television while in bed. I bought more and gave them to my son." “I am having a wonderful experience with Eyemax-plus. I have been taking it for about 2 weeks. I am seeing better. My cataracts are no longer cloudy... My night driving has improved, I can see better..."
At my eye exam, my doctor said that I was developing cataracts and changed my contacts. I saw the specialist for cataracts, and he said it wasn’t bad enough to have surgery... .
*The testimonials on our website reflect the real life improvements experienced by some of our customers. We do not claim that these results are typical. Vision improvement is very personal and you may experience different results.